Thinkspace is honored to welcome back an exciting young contemporary artist hailing from Japan. 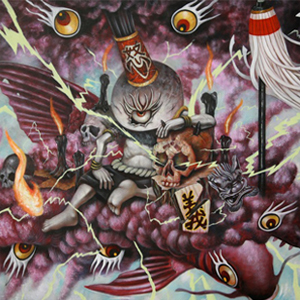 Yosuke Ueno returns for his 3rd solo show with our gallery. 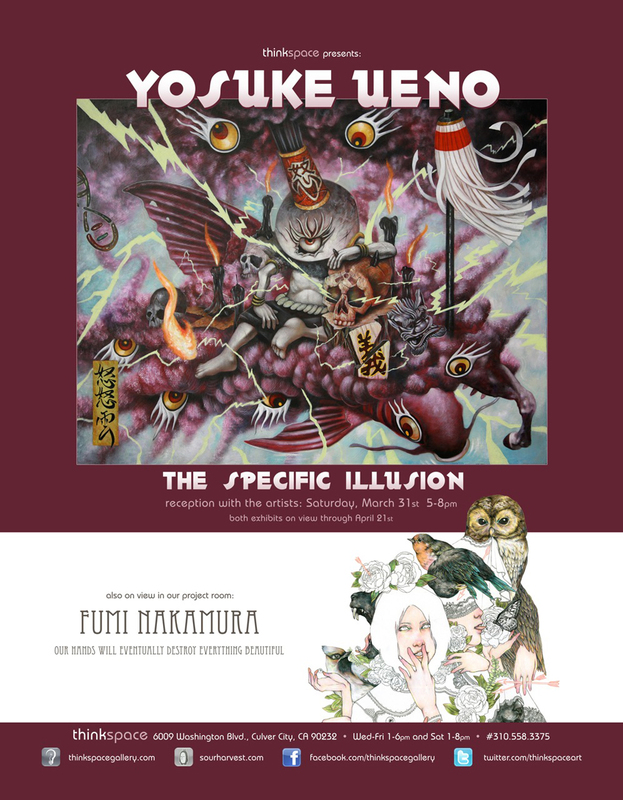 ‘The Specific Illusion’ features Ueno’s most powerful body of work having been strongly influenced by the changes in Japan since the Great Earthquake and Tsunami of March 11th, 2011. The resulting body of work traverses a wide array of human emotions that showcase just how much Ueno has grown as an artist in the past year and just how strongly the events of 3/11 have impacted him and the people of Japan as a whole. Yosuke Ueno was born in 1977 in Japan, but might as well be from another planet. Bizarre, surreal and thought provoking, Ueno has been building upon his visual vocabulary since early childhood, having held his first solo show in Yamaguchi when he was only sixteen. Self taught and always moving forward, the main themes in Yosuke’s art will always be love, space and positive energy. His work is very cosmic in nature and features a great amount of recurring symbolism. The colors red, green, yellow and blue appear often in his work. These colors represent the four bases of DNA: adenine, thymine, guanine and cytosine (A, T, G and C) – molecular elements that all animate beings share. Yosuke paints these colors and A, T, G and C with a simple universal message that all animate beings should have equal worth. The Great Earthquake and Tsunami that attacked eastern Japan on March 11th, 2011 and the resulting accident at the nuclear reactor in Fukushima are forever etched in our memories. 3/11 is an unforgettable day for all the people that live in Japan and Japan has suffered a great trauma. In fact, I have created many works that derive from these events. Our daily life has had to totally change since that day. I almost couldn’t believe that I am living the same world where we had lived before 3/11. Everyone in Japan now distinguish their lives as before 3/11 and after 3/11. I remember well staring at blank canvases, trembling with great fear remembering those days. The quake has brought a specific shape to my art that have had some obscure illusions. In other words, ‘The Specific Illusion’ is a special exhibit where I express my experiences “after 3/11” from various aspects of my life.